The desert is not a place where water is taken for granted. In desert cities, water must be managed. Each of the AMWUA member cities has a water management plan and part of that plan is storing water. The water would be used during times of Colorado River shortages, such as those we might be facing because of falling water levels in Lake Mead. Storing water is a tricky business in the desert. Pools and lakes lose large amounts of water to evaporation each year. Water tanks are just too small for the amount that needs to be stored to provide a cushion. Underground is the secret to desert water storage. Cities store water in aquifers. Underground water storage is an investment in the Valley's water supply resiliency. Over the last two decades, the AMWUA cities have collectively invested $400 million in storing nearly 1.7 million acre-feet of water underground. That's enough water to meet the needs of the AMWUA cities for more than 2 years, but it would never be used up that quickly because of the diversity of our water supplies. Let's take a closer look at what's involved in storing water in underground aquifers. What is an aquifer? It is not an underground lake or river. It is not a basin deliberately carved out under the ground. Officially: An aquifer is any geological site that can yield usable quantities of water. Unofficially: An aquifer is an area deep underground where water settles between rocks and gravel like water would settle in a pail of golf balls. How do cities store water in the aquifer? There are three common methods used to store water in the aquifer. Recharge basins, each usually a couple acres in size, are constructed to retain water to allow it to quickly filter into the aquifer. Cities use tractors to regularly turn over a foot or two of dirt at the bottom of the recharge basin to make it easier for the water to seep through the soil. Recharge basins are usually in groups of five to seven to provide sustainable capacity. Vadose zone wells are small diameter wells that reach only about 100 to 150 feet underground into the dry soil. (This space between the land surface and the aquifer is called the vadose zone.) If the wells are sited in a good geological location, gravity carries the water from the vadose zone into the aquifer. Vadose zone wells are inexpensive and have a small footprint, so they can be unobtrusively built in medians or parks. But over time they begin to clog and have only about a five to 10-year lifespan. Injection wells are large diameter wells that inject water directly into the aquifer in a very specific area. Many injection wells are also used to pump water from the aquifer when necessary. The footprint of an injection well is slightly larger than a vadose zone well and they are far more expensive, but these wells have a much longer lifespan of about 50 years. The City of Phoenix has drilled three injection wells since 2010. Chandler has drilled 24 injection wells in the past 15 years. Where does the water that is stored come from? The AMWUA cities store underground reclaimed water and a portion of their allocations of Colorado River water delivered through the Central Arizona Project. Water from the Salt and Verde Rivers delivered by the Salt River Project is generally not permitted to be stored underground. However, some AMWUA cities helped pay to increase the storage capacity behind Roosevelt Dam and are permitted to store underground their portion of the water captured by the Dam. The City of Peoria uses recharge basins and vadose zone wells to store about 11,000 acre-feet of water underground each year. The city began storing water in 2004 and now has 117,000 acre-feet in Long Term Storage Credits. To put that in perspective, each year Peoria uses about 30,000 acre-feet to meet the water needs of its residents and businesses. This means the city has nearly 4 years of supply in reserve underground. The City of Chandler began using recharge basins in the mid 1990s and built its first of 24 injection wells in the late 1990s. Chandler stores from 10,000 to 200,000 acre-feet a year and has 350,000 acre-feet of Long Term Storage Credits. Chandler uses 60,000 acre-feet per year to meet the water needs of the city’s residents and businesses, so the city has almost 6 years worth of water stored. So we have nothing to worry about, right? No plan is ever perfect and some cities will be able to pump their Long Term Storage Credits more easily than others. But there's a bigger problem. Current law allows a city (or another entity) to store water underground in one location and pump it later from a completely different location. 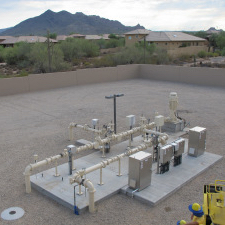 So someone could store water underground near Buckeye and later pump it in Apache Junction. In this case, the water being pumped is not the water that was stored, but groundwater, or just as bad, water stored by someone else. This disconnect between the location of water storage and the location of pumping can also lead to localized areas of groundwater decline. It is an unsustainable practice that Arizona lawmakers should address.